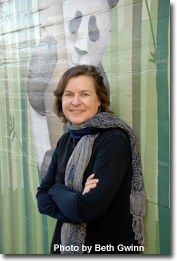 Karen Joy Fowler is the author of five novels and two collections of short stories. Her first novel, Sarah Canary, was the winner of the Commonwealth Club medal for best first novel by a Californian. Her fourth, The Jane Austen Book Club, was a New York Times bestseller. Her short story collection, Black Glass, won the World Fantasy Award in 1999. She was born in Bloomington, Indiana, but moved to California at the age of eleven. She went to UC Berkeley as an undergraduate and has an MA from UC Davis in Political Science with a specialty in Northeast Asian studies. She currently resides in Santa Cruz with her husband. They have two grown children and three grandchildren.